By purchasing this pre-order of Spriter 2 you will immediately receive a full copy of Spriter Pro so you can start animating right away. IMPORTANT: If you've already purchased Spriter Pro in the past you do NOT have to make this purchase. You will automatically receive Spriter 2 as a free upgrade as soon as it becomes available and will be able to register for private alpha testing once it is ready. Spriter 2 is being built from the ground up to offer a new level of flexibility and ease of use for 2d game animation. It will be built around advanced image deforming, bone and curve manipulation, and lots of other completely new features to help game creators make the most impressive visuals as easily as possible. 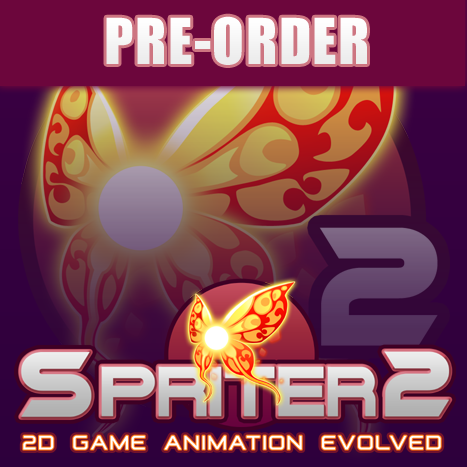 The official retail price of Spriter 2 is not yet decided so we are currently setting this pre-order at the retail price of Spriter Pro. The final retail price will likely be considerably more so now is a good time to reserve it at this low price. Spriter 2 is still in early development. Some time in 2018 it will first be released for private testing by the members of the Spriter community who have purchased this pre-order before August 3rd 2018 or who purchased Spriter Pro before August 3rd.